Stained glass housed throughout chapels can make an impact on anyone that walks through your doors. For stained glass in the main observatory, these lend imagery for each sermon which really offers true inspiration for new congregation members and returning ones alike. Inspirational stained glass can be placed in many areas of a church, providing sanctuary and safe haven for so many people. Whenever the sun hits these inspirational stained glass windows, it casts this heavenly glow that can be truly transcending and other-worldly. Achieve that authenticity and authority by installing custom stained glass. Being able to portray what’s meaningful to your chapel specifically can have quite the impact on the community. Inspire new members to join while offering pride to those that go there regularly. Stained Glass Austin loves inspiring our community and giving back through something we’re very passionate about. Work with our stained glass team to create something very inspiring and captivating. 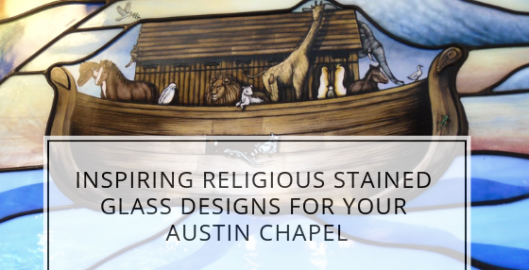 We have all the tools and techniques to create religious stained glass that can remain a staple for your community. Our design team has worked with numerous church committees and can definitely help you with this process.